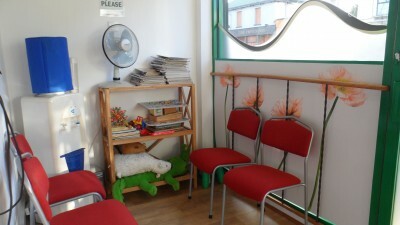 The clinic has three treatment rooms and a waiting area with toys, books and magazines. It is fully disabled accessible. The first appointment will usually take about an hour, and follow up appointments approximately 45 minutes. At a first appointment, we gather personal details, a history of the problem and of the person as a whole. For a baby or child this will include details of the pregnancy and birth. We ask for details of medical history, past accidents, operations, illnesses and dental work so that we have a comprehensive understanding of what has happened. A typical examination will include a combination of movement, orthopaedic and neurological tests and palpation (gentle touch). You may be required to undress to your underwear if necessary for examinination or treatment. You can bring suitable clothing, and privacy and gowns are provided. You are welcome to bring somebody with you to be present at your session. Your practitioner will explain your diagnosis in simple terms, and advise you of an appropriate treatment plan. Then with your agreement some treatment is typically done on this first visit. Treatments can be tiring and you should not expect to participate in vigorous activity for up to 48 hours aftewards. Babies and children may also be unsettled for up to 24 hours. The clinic is calm and family friendly. The toilet has baby changing and child facilities. All areas are fully accessible for buggies and wheelchairs. There is artwork from our patients on display, to enjoy. The fish tank (with 14 year old Boris the big catfish) is a particular favourite with all. Treatment rooms are spacious and a comfortable environment, to experience the care and professionalism of your practitioner. My daughter has just played her cello for the first time in four months without experiencing pain. Stephen, we are amazed and delighted! Lara’s thoughtful, gentle, confident and knowledgeable approach results in the most expert therapeutic massage one could hope to receive. The outcome is therefore a very holistic one in which specific discomforts have been eased with and overall relaxation achieved at the same time.